International days of the Nyckelharpa at castle BURG FÜRSTENECK (Germany), Nyckelharpa workshops with Marco Ambrosini, David Eriksson, Josefina Paulson, Olena Yeremenko, Didier François, Jule Bauer, Annette Osann, Johannes Mayr. Nyckelharpa concert, conference. Keyed fiddle, key fiddle. 4th October, evening: Conference on "Recent Developments"
… more than just a weekend of playing! 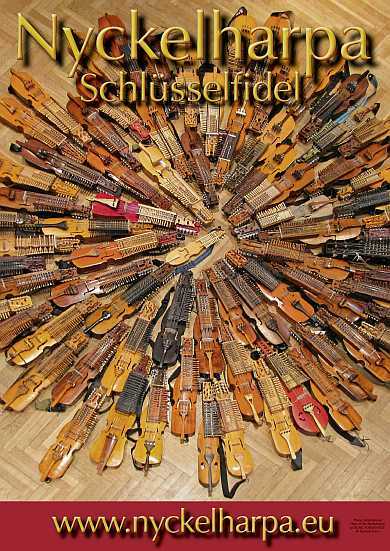 The nyckelharpa (Schlüsselfidel, viola d’amore con chiavi, keyed fiddel) is a string instrument played with a short bow and keys that change the pitch. Its resonance strings contribute to its unique sound. From Late Middle Ages the nyckelharpa emerged in Europe. However since the Baroque Period it has only been played in Sweden mainly around Upland as a folk instrument. Thanks to innovative musicians in Sweden, especially Eric Sahlström (1912-1986), and inspired musicians in continental Europe, the nyckelharpa is being rediscovered all over the world and being used in many musical styles. 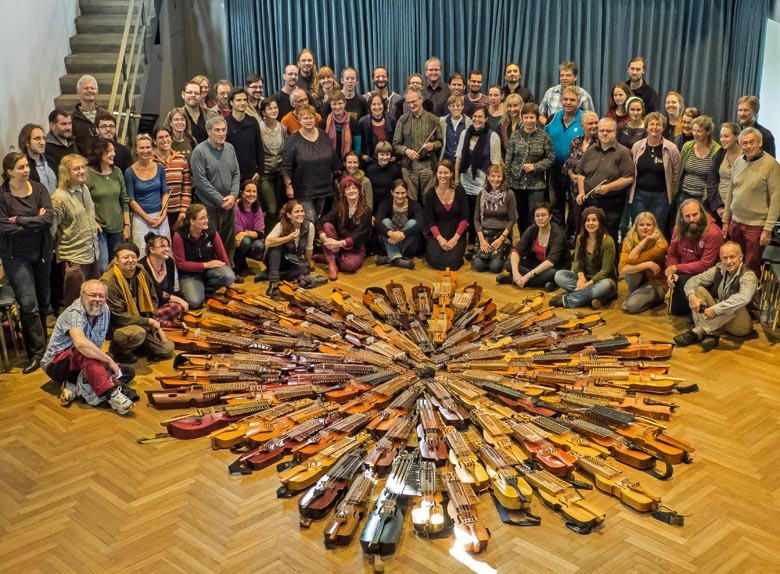 This invitation is intended for people from everywhere with all levels of nyckelharpa experience (as well as people motivated to learn) to play, share experiences, and take lessons together. Instruction will be given mostly in English. Additional languages are possible depending on the teachers. Some help with different languages is usually available by participants in the single workshops..
For the above workshops please specify your preferred workshop when filling the application (and possibly a second choice workshop, if your first choice is already full.). Early music: "Antonio Vivaldi" – Pastorals, Gigues, Allemandes and the Four Seasons of the "Red Priest"
This course is aimed at the more advanced nyckelharpa player and requires preparation using previously sent tasks, sheet music and audio files. To make it possible for us to send you the tasks and for you to do the preparation we ask for early application for this workshop to evers@burg-fuersteneck.de . The number of participants is limited. The number of places for instrument and bow makers is limited, early application is recommended. Marco Ambrosini , Eifa/Hatzfeld (Germany), studied violin and viola, theory and history of music and composition in Ancona and Pesaro. In 1982 he founded the famous ensemble " Oni Wytars " together with Peter Rabanser and in 1991 the "Katharco Consort" together with Katharina Dustmann. He works as a soloist and composer in many international ensembles for early and contemporary music. He was the pioneer for nyckelharpa in continental Europe. In 2012, he published a book of daily exercises for the nyckelharpa. David Eriksson, Tobo (Sweden), comes from Västerbotten in the north of Sweden but now lives in the north part of Uppland. He is a member of several bands and constellations and he frequently appears as a guest artist in many different kinds of bands and genres. He is a professional nyckelharpa player and he studied at Eric Sahlström Institute for nyckelharpa, and continued with a Bachelor’s degree and pedagogy degree at the Royal College of Music in Stockholm. He is a “Riksspelman”, has won the Swedish championship in older traditional nyckelharpas, and has received several other scholarships and awards. 2016, he won the worldchampionship with the kontrabas harpa. Beside the bands, he works as a teacher, composer, writer and a freelance musician and he is a nyckelharpa maker, too. Didier François , Antwerpen (Belgium), studied violin, composition and Jazz in Brussels and Amsterdam. He has performed on violin and nyckelharpa with Stefane Grappelli, Gabriel Yacoub, Michel Risler, Armand Amar. He has composed for ballet, film and theatre, is a sculptor, and he has been teaching for many years. Johannes Mayr, Breitscheidt (Germany), musician and instrument maker. He has been active for more than 20 years as a folk musician with accordion, nyckelharpa, organ, contrabass and vocals. Having grown up with Bavarian-Swabian folk music, he has mastered and practiced many styles of classical, medieval, folkmusic of various styles (from modern to completely traditional, from French-Breton, Irish-English to Scandinavian). Musicians at Cassard (Traditional Music of Tomorrow), La Marmotte (folk celtique) and the Trio Larsson / Mayr (nordic folk). He also teaches various workshops. Johannes Mayr is a graduate of the European Nyckelharpa Training. Since 2012 he has specialized in the Nyckelharpa building with his own workshop. Annette Osann , Dole (France), is a trained violin maker, and since 1998 specialized in building nyckelharpas. After various ensemble activities for early and traditional music as a cellist and nyckelharpa player she is using the nyckelharpa today mainly in Baroque music. 2005, foundation of the duo Arcangelo with Juliette Thiebergien (baroque cello), and since 2009, chamber music. Cooperation in the duo nyckelharpa and organ with Elise Rollin (organ). Since 2013, together with Caterina Other, Jule Bauer and Susanne Brameshuber founding of "Nyckelharpa quartett", 2014, founding of the ensemble for Renaissance and Baroque music "Le Insolite Note". Josefina Paulson, Västmanland (Sweden), is a modern musician strongly rooted in the tradition and you can hear the dialect of folk musician in everything she plays. She became Riksspelman (national folk musician) in Delsbo in 2008 for the “lively and skilful playing of music from Västmanland”. In 2009 she received a cultural award in Västmandland for embodying folk music from the region. In 2011 Josefina received the ”Bror Hjorth Scholarship” with the jury’s motivation ”technically brilliant, very committed performance on the nyckelharpa with both the preservation of cultural traditions and a gentle personal and creative rejuvenation”. 2016, she won the world championship with the modern nyckelharpa. Josefina studied on the one year course at Eric Sahlström Institutet and also has a bachelor in music, with the nyckelharpa as her main instrument, at the Royal Academy of Music in Stockholm. Olena Yeremenko, Warszawa (Poland), was born in Ukraine in an artistic family. She started playing violin at the age of four and graduated later the conservatory in Lviv. After studying she turned her interest into European traditional music and co-founded the Burdon Folk Band. She has also taken part in numerous projects in Ukraine and Poland She has recorded Telemann’s Polish Dances with The Orchestra of Age of Plague and cooperated with Gardzienice Theatre Group as a leader musician and an actress. Recently, she has taken part in a progressive rock project „Ichthyander Dad’s Only Dolphin” and joined Polish early music group “Dancerye”. Olena's experience in playing Central and East European tunes allowed her to draw a unique timbre out of the nyckelharpa voice when playing Bulgarian, Moldavian or Ukrainian music. She easily connects styles of different folk music styles with modern ways of musical expression. starts on Thursday, 3h October, 2019 with dinner at 6:30 pm and ends on Sunday, 6th October, 2019 at 1:00 pm. 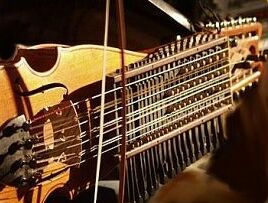 On your registration form please tell us the level of your nyckelharpa experience.An indication of special interests and/or requests will help us prepare a program suited to your expectations. This fee includes all tuition and program, accommodation at the castle and good and optionally vegetarian food. Youth fee is available for young persons up to 26 years of age. The subsidized rate can be granted to people who are on a low income and are in receipt of statutory social benefits or only have a comparable low income (proof required). Rental charges remain unaffected. Please indicate at the time of registration and provide proof. No discount can be granted retrospectively. (Many thanks to the artists and to Bernd Segnitz, who produced the videos.